For 25 years, the Legend of Zelda series has stood largely unchallenged as the king of the action-adventure genre, with both Ocarina of Time and the original The Legend of Zelda holding the top two spots for high sales. 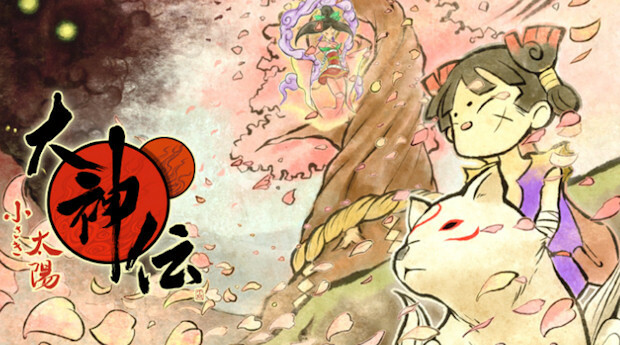 In 2006, however, one game came to challenge Zelda‘s throne – Ōkami. While the game suffered from poor sales performance, probably due to the fact that it released on PS2 on the eve of the PS3’s release, it earned high acclaim and even today can be found on various top games lists. The game’s transition to Wii gave it a much-needed sales boost that led to the production of a DS sequel known as Ōkamiden. Given that my wife and I are personally huge fans of the first game I thought myself morally obligated to pick up the DS installment. The game officially releases tomorrow, but I’ve got some early impressions to whet your appetite a bit. The original Ōkami, while it had its share of light-hearted moments, particularly regarding the chief sidekick, Issun, was very much a heavy story, full of the bloodshed, betrayal, and tragedy one usually expects from traditional folklore. Ōkamiden‘s move to DS not surprisingly gives it a more kid-friendly tone, from the fact that the main cast is made up primarily of children to the somewhat softer story and script. The story itself is cut from the same cloth as the original game, however, so there’s no need to worry about this shift alienating the older gamer. The premise is simple: a few months after the events of Ōkami, evil demons begin to swarm the land of Nippon once again. 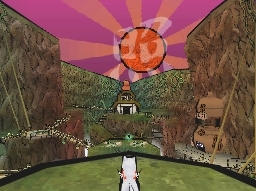 In the midst of the crisis, a young wolf god named Chibiterasu appears to battle the evil and save the country. Sound familiar? 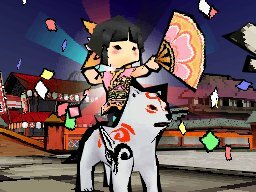 It should – and there are a lot of other familiar story elements and setpieces for fans of the original Ōkami, such as the iconic Kamiki Village and Shinshu Field, as well as many others. There are still enough unique elements, characters, and locales to keep things fresh, so don’t think this means it’s a total rehash. As you guide Chibiterasu in his journeys across Nippon, you’ll run into several young characters that can help you on your quest. These partners will offer their attacks in battle and after a certain point in the game they can even assist with progression in the field (controlled by the Touch Pad, of course). Some partners even have elemental affiliations that you can utilize for your special techniques. Ōkamiden makes excellent use of the DS’s Touch Screen to control the iconic Celestial Brush, a magical paintbrush that the gods use to manipulate nature. You can still cut through things, make trees bloom, and manipulate plant life, fire, water, and more in just the same ways that you could in the first game. Those who encountered problems with the Wii controls will be pleased to know that the DS version is a lot more accurate. There’s still the occasional instance when drawing a Cherry Bomb doesn’t quite register, though, and the smaller screen can sometimes make it hard to connect the right objects in certain cases, but these problems are few and far between. 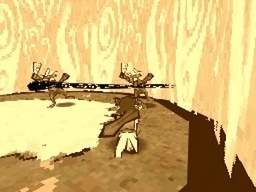 So far the brush techniques have been borrowed directly from the first game, with the exception of a skill that lets you control your partner character independently in order to solve puzzles and eliminate obstacles. There’s little to no learning curve for Ōkami vets, and most of the techniques are simple enough that even new players should be able to master them with a little practice. The visuals are more or less what you’d expect from Ōkami, with beautiful traditional Japanese-inspired artwork that really makes the game look like a brush painting. Despite the DS’s vastly inferior graphical prowess against the PS2 or Wii the game still manages to look freaking excellent and largely faithful to the original graphics – although one might wonder why given the game’s proximity to the 3DS release it wasn’t just saved for that platform instead. Will the Sun Rise Again? I’m only a few hours in at this point, but I think it’s safe to say that this game largely lives up to the legacy of its predecessor – it’s got about the same level of difficulty, although I’d probably rate it as slightly easier; it makes excellent use of the brush skills; it’s got bosses that test your mastery with the brush in a similar manner. As a DS game the world isn’t quite as fully-packed with secrets and goodies as the first, but it still does well as a handheld edition of the game. If I have any major gripes, they’re with the largely linear game design – but of course this was a problem with the original as well – as well as the occasionally poor script. I’ve run into a few typos and a couple moments where bad localization shines; nothing to render the script unreadable by any means but still almost embarrassingly sloppy and strong evidence that this game was rushed out to beat the 3DS launch. All in all, though, I’d say Ōkamiden can certainly stand as a worthy sequel – but perhaps it might have done better had it not been restricted by its timetable or by the DS’s hardware. As the DS’s swan song, it’s definitely one of the best DS titles I’ve picked up (although admittedly I’ve missed out on a lot of greats it seems), so if you’re finding yourself caught in the Nintendo drought and not quite rich enough to buy yourself a 3DS in a couple weeks, Ōkamiden can certainly serve as an excellent distraction in the meantime.